Posted on October 11, 2013 by Patricia Tilton •	This entry was posted in Ann Malaspina, International Day of the Girl, Multicultural, Perfect Picture Books and tagged Educating Girls. Bookmark the permalink. Thanks for sharing such a unique book premise. Yes, American kids need to know how valued education is in other parts of the world. American kids really need to know how education is valued in other parts of the world. Hopefully, Malala will bring this home in and even greater with her determination and efforts to make her voice heard. So wanted her to win the Nobel Peace award today. I completely agree with Tina’s comment above. Great review! Thank you, I’m glad you liked the book I shared. And, I agree with Tina too. Great selection for today, Pat. Also it is super to see a book set in a country many children know little about. I have spent days among the brick chippers in Madagascar. Joanna, I was thrilled to find a book about Bangladesh. Haven’t reviewed one in that area. I’m sure you’ve seen a lot of child labor in your travels. What a great book to share! I love stories – true or nearly true – that illustrate life in other parts of the world. They expand our horizons and make us appreciate the things we take for granted: being able to go to school instead of work; food on the table – even having a table to put food on… Thanks! I am pleased you enjoyed my selection for today! We all need to expand our horizons in the world and not take things for granted. Excellent post Ms Tilton! This looks like a fine book with a thought provoking message. Thanks! Thank you Rhythm! It does have a strong message and one you could easily share in a classroom and get kids thinking. My sixth grade teacher had us attempt to squat as long as we could, one way to get the feel of what life is like for others. Sounds like a really greta book for the classroom. You had a smart sixth grade teacher. That’s no easy task. She certainly got her message across, because you still remember. It is a good book for kids who take education for granted. Great choice of book. Life around the world can be so different from our own, in ways both good and bad. Yes, I agree. We have so much to learn from each other. Social media is certainly breaking down barriers and making us realize our differences. As human beings were not all so different with our wants for our children and families. here,here! Great message in this book. Thanks, Pat. I agree whole heartedly with what Sue and Tina both said. The world is not such a big place, but oh there is so much to learn. Yes, I was delighted to find this book Diane. Knew you’d appreciate it. Yes, there is so much to learn and do. Have you sponsored any more parties for Big Brother Mouse? I know you long to go back there. This sounds a lot to me like what the Breaker Boys had to do in the coal mines here in Pennsylvania. I always feel sad when I read about Child Labor. This is an important story for all kids to learn – especially that it still happens right now! Glad you could relate to it Erik. I didn’t know about the “breaker boys” and we have coal mines in southern Ohio. Yes, I feel sad about child labor too. That’s why I admire young people like Malala who is standing up for girl’s rights and the Canadian boy who took up the cause to fight child labor in the middle east after heard about the Pakistani boy who tried to free kids from the carpet mills. There are a lot of conscious kids out there — just like what you’re doing for Renn. It’s work that comes from the heart. Anisha’s Adventures in Bangladesh sounds like a good book. Wow, this sounds like such an excellent and needed book, Pat. And it reminded me of what Malala has said about education (what a force for good she is in our world). Thank you for making us aware of this book. Thank you Beth. It was an excellent book and very appropriate for today. I tried to carry the theme of educating girls in my reviews this week. Also liked that the story was in Bangladesh! Oh, I have to find this book! We had very good friends live in Dhaka for a few years as missionaries. We studied a good deal about the country that first year in homeschool. My kids will enjoy this one. It’s in the library. It would be a wonderful book to share with your kids, especially with your friends living in Bangladesh. Another good story that shows the value of education, and shares an unfamiliar culture. Sure to make everyone appreciate what we have. Thanks for this, Patricia! Thank you Jarm. 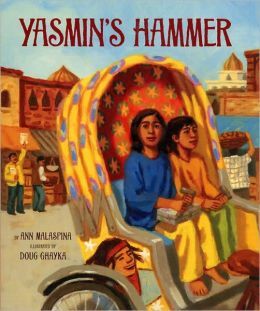 I tried to focus my MG and PB reviews this week on the need to educate girls, and share different cultures at the same time. A perfect book for UN International Day of the Girl Child. Thank you. I thought the book was a great representation of how girls want to attend school! Pat, we are studying natural disasters as part of Jr. FIRST LEGO League. You mention a cyclone. This might be a good book to bring in. Yes, the book does address cyclones in the first few pages as the reason for the move and shows illustrations of before and after — briefly. But the focus is on child labor and little girl who wants to go to school. Rocco’s book is about the blackout in NYC and could be used for a disaster. There is a huge cyclone hitting India right now. I did see the news about India. And I’ll check on Rocco’s book. I was also thinking of “MAMA” about the tsunami in Indonesia that separated the hippo from its mom. Yes, I know there are books about the tusnami but don’t know the grade level. Great timing so you can have the kids watch the news, if appropriate. This look perfect in many ways. It was a great book to share yesterday! This sounds like an excellent choice, and so appropriate for the UN theme. I agree. Visiting a “third world country” opened my eyes to a new way of looking at life. I’m looking forward to all the back-matter you mentioned. Thanks. I tried to find books that related to the theme of educating girls in third world countries. I also review MG/YA novels on Mondays, and you might check A Girl Called Problem and Sylvia and Aki. I added additional links to information. Thanks for sharing this title. Glad to see there are books out there like this. Yes, I agree Darshana. As you know, school is a privilege in so many countries — something first world children don’t understand. Heart-wrenching story, Pat…perfect choice for International Day of the Girl…or any day! Thanks for sharing it…we need more books like this one to raise awareness of these issues. Exposing our children to stories like this one will help them gain a better understanding of the world and a greater appreciation of all that they have. 🙂 Great review! Thank you Vivian. I am glad that you see the importance of a book like this for kids. There are number of books out there. This book sounds fantastic, Pat, and an excellent choice for International Day of the Girl! Thanks so much for adding it to our list! It is an excellent book for our list. Kids need to see how important going to school is for kids less fortunate.